About Us - Kapiti Playhouse Inc.
We were founded in 1948 and since then we have produced at least three or four major productions each year in our own theatre in Ruahine Street, Paraparaumu. We also hire out our theatre and equipment to other like groups and schools. 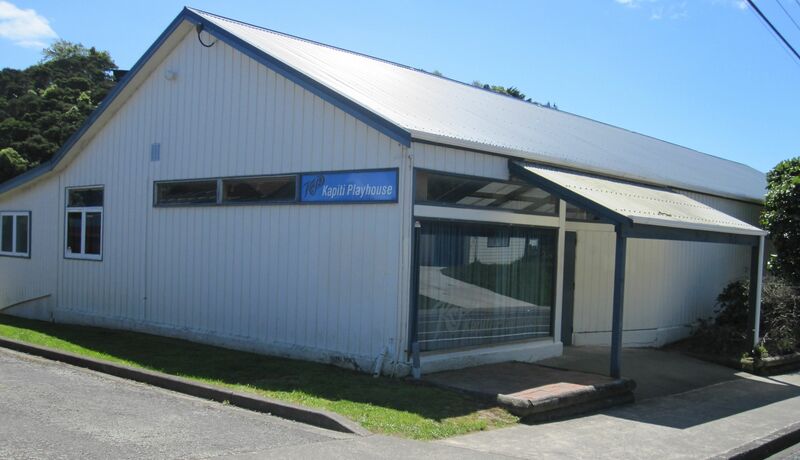 Click on history for a brief account of the history of Kapiti Playhouse. Kapiti Playhouse is an entirely voluntary organisation. There are many ways in which people can become involved with the theatre, including:. If you have carpentry skills, creativity, technical know-how, sewing skills, an eye and flair for costumes, hair or make-up, imagination and creativity for making or collecting props, or an acting desire or ability – then there is something available to interest you at the theatre! From time to time we run classes to teach aspects of theatrical crafts. Open auditions are held at our theatre for all our productions. Look for audition notices in our newsletter, Kapiti Observer and Kapiti News. If you are technically minded then this area will interest you. All productions require sound, lighting, costumes, props and a set. A set has to be built and decorated. Properties (Props) have to be made, or collected. Carpentry, creativity, artistic and painting skills are useful here. When the production is underway, we need a stage manager and backstage crew behind scenes changing the set between scenes and acts, and bringing on and taking off props. If you have flair and creativity with designing costumes, hair and make-up, then this is the role for you! If you enjoy meeting people then this is the place for you. Every show requires Front of House staff. Organisation, communicating, box office, greeting people, taking tickets, ushering, serving refreshments at interval, making our audiences feel welcome, are all part of Front of House. This is an essential part of any production. Without publicity, people wouldn’t know about our shows or our theatre. We rely on enthusiastic organisers who can prepare and distribute publicity material, ads and posters, and coordinate with newspapers and radio to promote the production. We are always looking for directors of plays. If you are an experienced director or you would like to learn how to direct a play, we would love to hear from you. There are many facets to theatre and there may be another area that has not been mentioned that could interest you. You may just be interested in being a member of our audience and keen to support the Playhouse. We occasionally hold club nights and visits to other theatres. If there is anything more that you would like to know about our theatre, please visit the Contact Us page for details on how to get in touch with us.